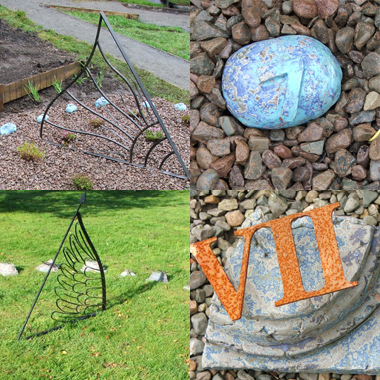 Jane Gaze -Unique sundials designed and made for any location, incorporating stoneware ceramic elements, a beautiful addition to your garden. I love gardens and believe that every garden should have a sundial. The sundials I make incorporate ceramic elements fired to 1260 degrees, making them frost-proof. Commissioned sundials are individually designed and calibrated for their specific location, and can be adjusted to accommodate winter and summer-time clock changes. I often use a dry glaze surface treatment which gives an aged and weathered look and is sometimes mistaken for lichen growth. I am keen to develop this area of my practice, contact me with your specifications.